Tibetan Mastiff Sells for $582,000! 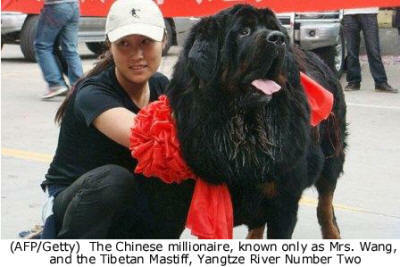 A black Tibetan Mastiff , 80cm (31in) high and answering to the name of Yangtze River Number Two, is believed to have broken the world record as the most expensive dog after a Chinese woman paid (£352,000) or $582,000 for the “priceless” canine. In keeping with its record-shattering status, according to local reports the 18-month-old dog arrived at its new owner’s home in stupendously excessive style. A motorcade of 30 luxury cars cruised to the airport in Xi’an to take delivery of Yangtze. Enchanted onlookers gathered to fête the arrival of the city’s new resident. If the figure of 4 million Yuan is accurate, it makes Yangtze River Number Two possibly the most expensive pet dog in history. Earlier this year, a family in Florida paid $155,000 (£93,000) for a Labrador called Lancelot Encore. That price included the cost of cloning the original Lancelot. The young millionaire, according to one report on a Chinese website, fell in love with the dog while on a breeding trip to Qinghai province. The woman, referred to only as Mrs. Wang, had been travelling to the town of Yushu with a Tibetan Mastiff that she already owned with a view to mating it with the famously pure-blooded hounds of that region. While there though she spotted a dog known as White Root and knew immediately that she had to make it hers. Another version of the story suggests that the woman had spent some years in the quest for the perfect Tibetan Mastiff and was satisfied that the dog she found in Yushu was it. “Gold has a price, but this Tibetan Mastiff doesn’t,” the young woman reportedly said on her return home. It remains unclear why she renamed the dog Yangtze River Number Two, though the process appears to have taken place while Mrs. Wang and her dogs were returning from the breeders. Before she left the northwestern province of Qinghai, Mrs. Wang is understood to have alerted her wealthy friends to both the sum she had just paid for the dog and the timing of her arrival. Her friends, in an opulent show of solidarity, not only dispatched their cars to the airport but arranged for local Xi’an dog lovers to brandish welcome banners in honour of the new dog. Courtesy of Times Online, the U.K. Click for additional coverage and related stories. The Tibetan Mastiff in China, part 1 pictorial history, by Lana Tsan. Visit The Llama, Club President, Museum, Fossils. A dog skull as big as a man's torso? Seeing is believing! The Tibetan Mastiff In China, part 2 reveals how the dogs are bred and how nomads protect their unmarried daughters in the white tent... fascinating stuff!